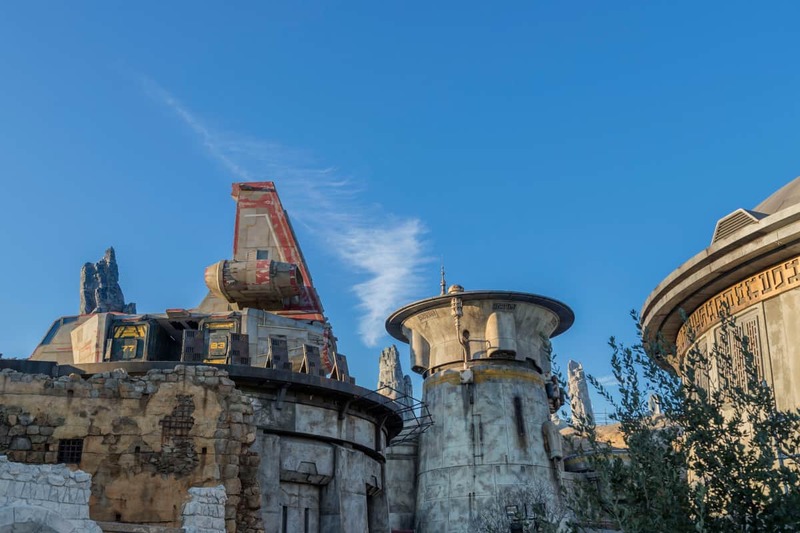 With the announcement of a new Star Wars land back in 2015, many fans set their sites on 2019 and the anticipated opening of Star Wars: Galaxy's Edge. To help pass the time, we've got all the latest Star Wars news and updates to help tide you over. But Star Wars fans don't have to wait until then because you can find Star Wars at Disney World right now! From attractions to characters to amazing nighttime entertainment, Disney's Hollywood Studios is loaded with opportunities for you to connect to your Rebel Side (or even your Dark Side). Where can you find Star Wars at Disney World? 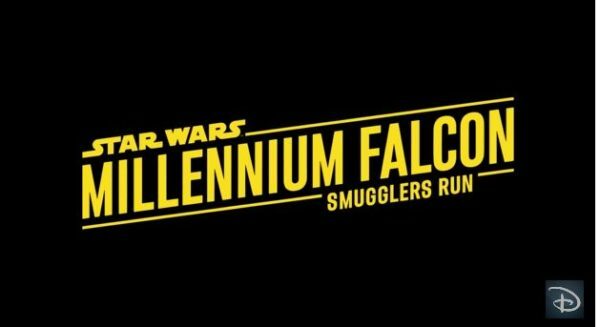 Millennium Falcon: Smugglers Run Height requirement: 38"
Star Wars: Rise of the Resistance Height requirement: 40"
The attractions get names & John Williams has been busy! Most of the Star Wars-themed attractions, characters, merchandise, and entertainment offerings are found at Disney's Hollywood Studios (which is also where the new Star Wars: Galaxy's Edge land is being constructed), but you can also find a dedicated Star Wars shop as well as a new immersive Star Wars experience in Disney Springs. This attraction allows guests to interact with beloved Star Wars characters, tour galleries of memorabilia and replicas of large-scale Star Wars artifacts, shop for special Star Wars merchandise at Launch Bay Cargo, and play the latest Star Wars interactive video games. Tips: Both Kylo Ren and Chewbacca will speak to you at their meet & greets, so you might want to brush up on your Wookie. 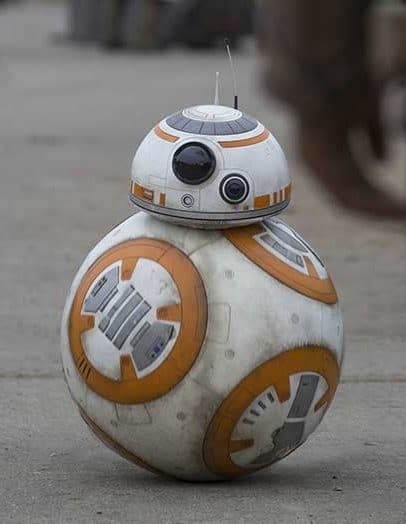 BB-8 just kind of sits there and does his BB-8 stuff. 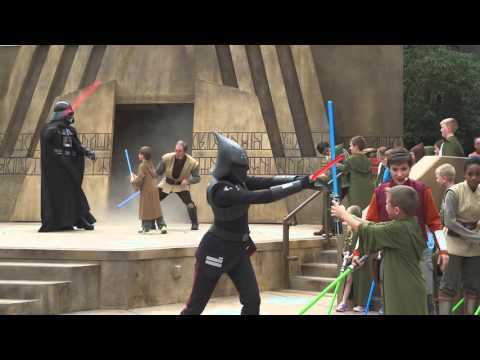 This outdoor show allows young Padawans to master their Jedi skills before facing off against forces from the Dark Side. Tips: This has traditionally been a fairly competitive event. Registration to participate is located at the Indiana Jones Adventurers Outpost store, and for the best opportunity to secure a spot sign up as close to park opening as possible. 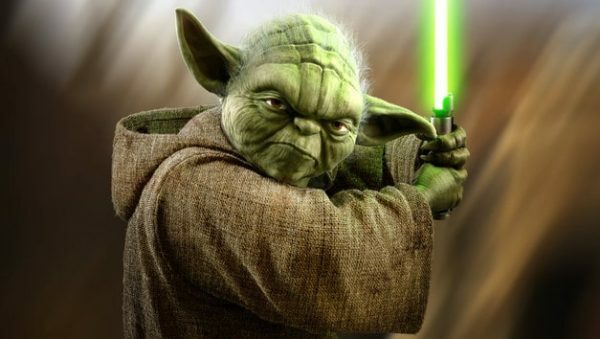 Check out our how-to guide for Jedi Training for more tips and suggestions. 3D flight simulator that takes guests through one of dozens of different Star Wars experiences including new characters and adventures from Star Wars: The Force Awakens. Suitable for: Anybody 40" or taller who can handle simulators and some rough movement. Tips: The exit area is a great gift shop. This brief film allows Star Wars fans to relive the stories of Star Wars Episodes I-VII. Tips: Perfect for people that would like to get caught up or need a refresher of the Star Wars saga. This live show brings several of your favorite Star Wars scenes to life and includes special character appearances from both old favorites like Darth Vader, as well as some new favorites from Rogue One: A Star Wars Story. Tips: The first show is usually the least crowded so if this is a must-do, consider planning on watching that one. One of the best parts of Star Wars at Disney World is this enhanced show that showcases pyrotechnics, special effects, and video projections, in addition to spectacular fireworks, all set to music from the Star Wars film franchise. Tips: In order to see all of the projections, you will need to find a place close to the courtyard in front of the Chinese Theater. Check out these maps to see suggestions for the best viewing spots. You can also get reserved seating by booking the Star Wars: A Galactic Spectacular Dessert Party. The place to purchase all of your favorite Star Wars merchandise at Hollywood Studios is at the appropriately named Tatooine Traders. Located at the exit of Star Tours, you'll find everything from themed Lego sets to light sabers to art. 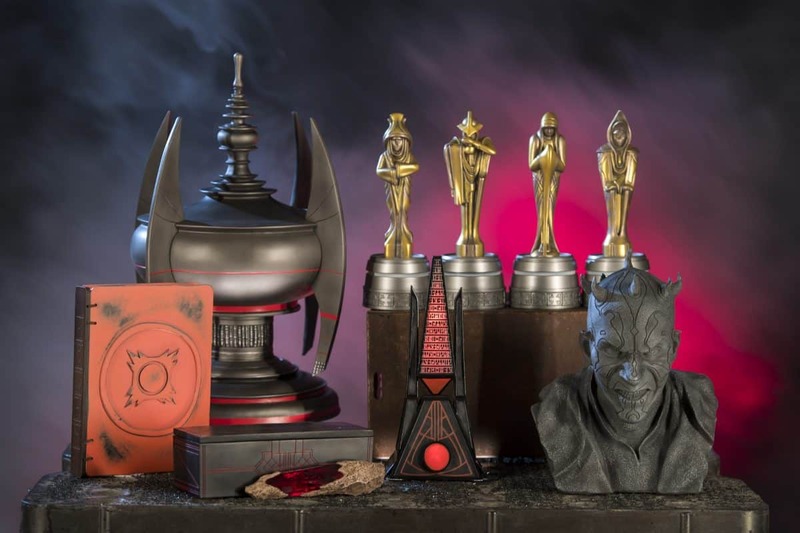 Tatooine Traders does have a limited selection of collectible Star Wars items, but for a wider selection you'll want to check out Star Wars Launch Bay Cargo. There you'll find items for the serious (and not-so-serious) Star Wars collectors. 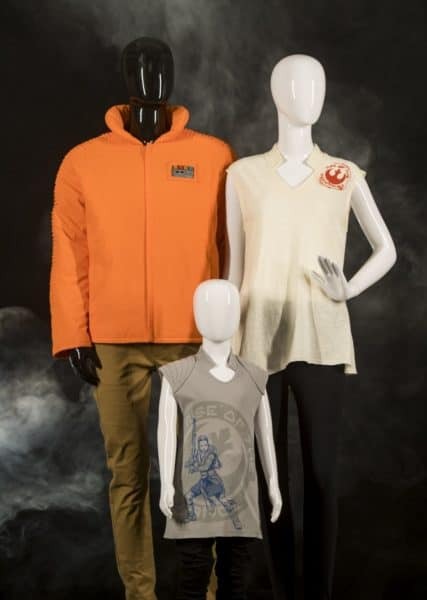 Located at the West Side area of Disney Springs, the Star Wars Galactic Outpost is a handy shop filled with some of the most popular Star Wars clothing, toys, and collectibles. This Star Wars themed shop is located in the Market Place area of Disney Springs. 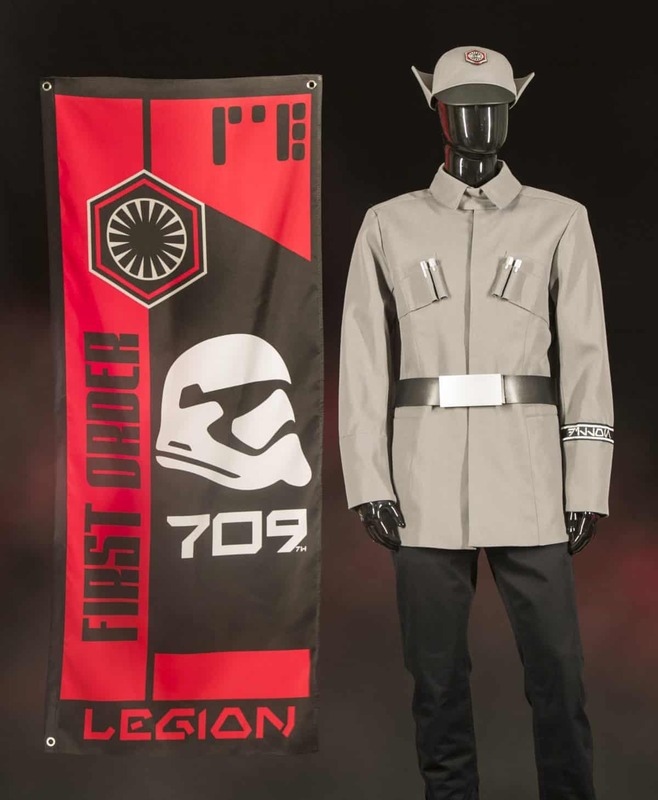 Apparel, accessories, toys and Star Wars plush items are all available here. Virtual reality has come a long ways and with the introduction of The VOID in Disney Springs, Star Wars fans now have a way to experience Star Wars like never before. 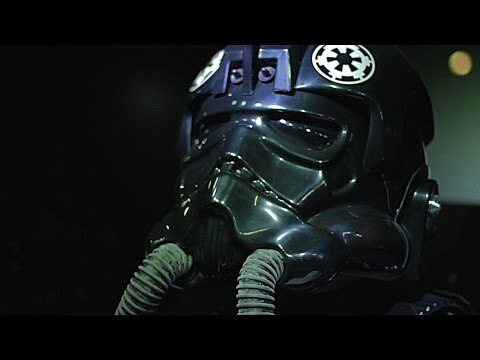 Using the magic of virtual reality, guests of The VOID's Star Wars: Secrets of the Empire will find themselves immersed in the world of their favorite movies as they don't just watch the story unfold - they become a part of it. Tickets for Star Wars: Secrets of the Empire are available now on The VOID's website. Location: south side of Disney's Hollywood Studios, just to the east of World Drive. This new resort will be a a "living adventure" that will allow guests to totally immerse themselves into all things Star Wars. 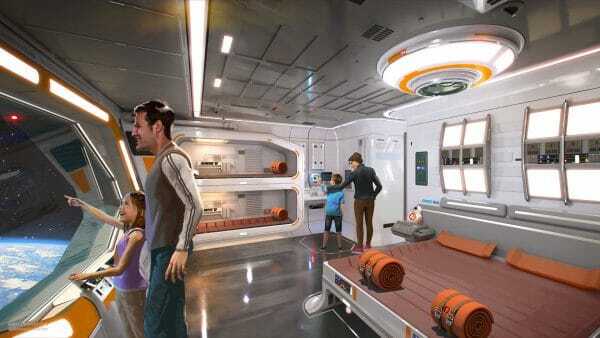 Unlike anything else on property (or likely anything else around the world), this new resort will be 100% immersive, letting Star Wars fans of all ages become a part of the story. 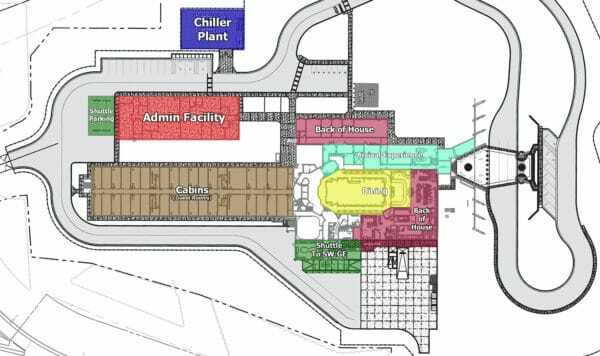 The California Coaster Kings website tracked down some permits that show a preliminary layout of the new resort. Check out their website for lots more detailed analysis! The first will be on August 29, 2019. At that time we definitely know that 1 attraction (Millennium Falcon: Smugglers Run) will be open. 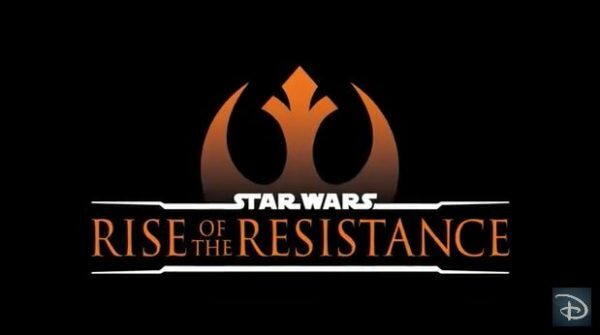 The highly anticipated "Rise of the Resistance" however, will not. As of now, we don't know an exact opening date for that attraction although Disney has said "later that year". Planet name: Batuu - a remote outpost that "was once a busy crossroads along the old sub-lightspeed trade routes, but its prominence was bypassed by the rise of hyperspace travel." 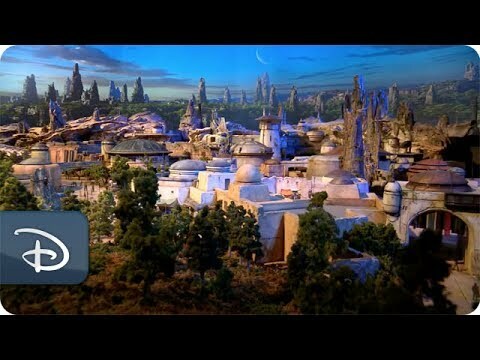 Now Batuu is a thriving port for anybody that might want to avoid detection, like smugglers, rogue traders, or those that want to avoid the First Order. 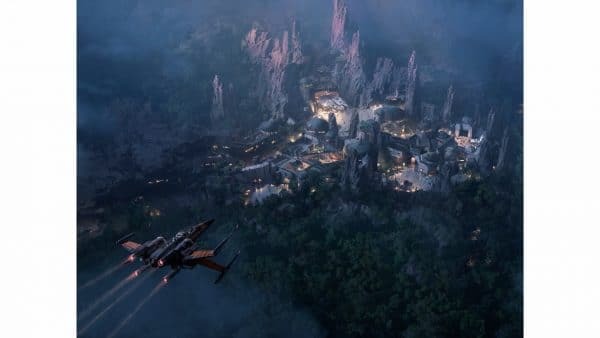 The village guests will visit on Batuu is named "Black Spire Outpost". The name comes from the geographical formations around it. Disney says, "Widely known for the petrified remains of its once towering ancient trees, the spires now stand guard across the river valleys and plains and have long captured the imagination of travelers to this planet." Immersion: The entire land will be an immersive experience where choices guests make and performance at tasks in the attractions will allow them to create a virtual profile that will then determine the interactions of the world around them. For example, do well on the Millennium Falcon attraction and you might earn extra galactic credits, but if you damage the ship you could end up on the list of a bounty hunter. Those determinations will then follow you as move through the rest of the area and provide opportunities to be a part of the action. The immersion begins at the entrance to the area. Using cleverly designed visual cues, guests enter Galaxy's Edge through enclosed passageways (like a tunnel) that, when exiting, create a framed view of the area. An important note for both attractions is that Disney has announced that FastPass+ will NOT be available when they initially open. We do anticipate that eventually FastPasses will become offered, however, Disney hasn't announced yet when that will happen. Disability Access Service (DAS) will still be available even when FastPass+ isn't. Guests will be issued a return time that is comparable to the current posted wait time. This attraction will put guests at the controls of the most famous ship in the galaxy - Han's Millennium Falcon. Guests riding this attraction will be assigned one of 3 unique flight crew roles (which sounds similar to how Mission: Space works). In addition to the ride itself, the queue area (which will be long to accommodate the expected crowds) will provide guests with lots to look at as it acts as a prologue to the ride. Guests will also be happy to know that they'll find some fun interactive elements as they wait that they'll be able to access with the Play Disney app. As for the story, the smuggler known as Hondo (from the animated Star Wars shows) is the man in charge of recruiting some new smugglers to help move weapons and supplies to The Resistance. And it is your crew's job to get the goods to the people that need them. But, unlike Mission: Space where the crew members' roles and assignments don't change the outcome of the attraction, that's not true here. Millennium Falcon: Smugglers Run will have a much more "choose your own adventure" quality to it which means the things you do - or don't do - will affect how the story plays out. And, how you do on your mission will follow you through the rest of your time on Batuu. For example, if you do poorly and wreck you might find the bartender at Oga's Cantina calls you out for your lack of piloting skills. 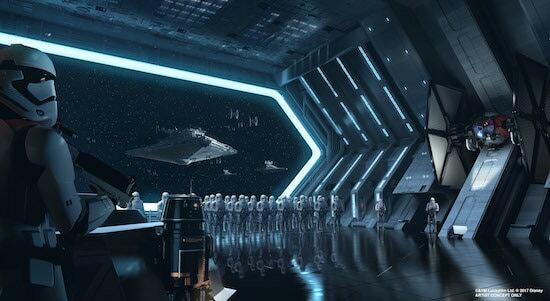 This attraction puts guests smack dab in the middle of the an epic battle between the Resistance and the First Order and considering Disney has said that this new attraction is "one of the most advanced and immersive experiences ever undertaken by Walt Disney Imagineering" all signs point to it being awesome. Like the Millennium Falcon: Smugglers Run, this attraction will also have an expansive queue designed to hold the crowds and if you look down, you'll see something that might look familiar: the tracks from the real R2-D2. And, the Play Disney app will also allow guests to dive even deeper into the prologue of the story before they board the attraction. Something (or, should we say, several somethings) else familiar is found on this attraction: Poe, Rey, Finn, and Kylo Ren (all created with footage from the original actors). 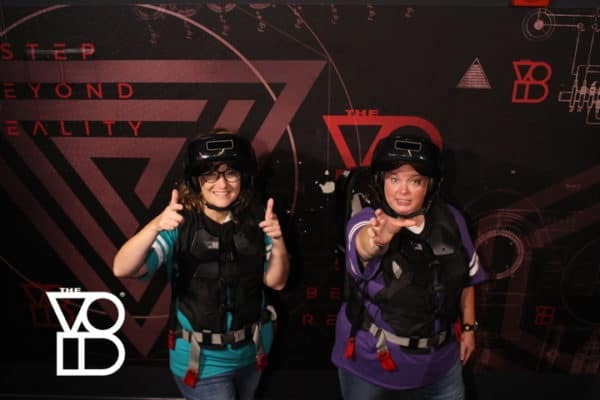 This attraction involves being taken through several larger-than-life rooms with fun names like the "interrogation room" and the less scary sounding "cargo bay". 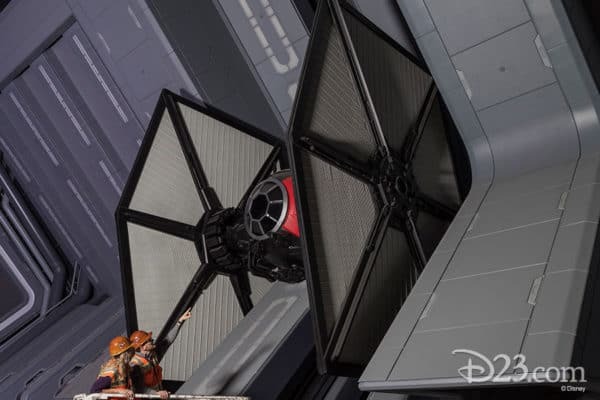 Guests can expect to see X-wing fighters, Animatronic Stormtroopers, and TIE fighters. This attraction has several stages - and although it has been rumored to last close to 30 minutes long Disney says that isn't the case. You start off being captured with Poe promising to return for help. 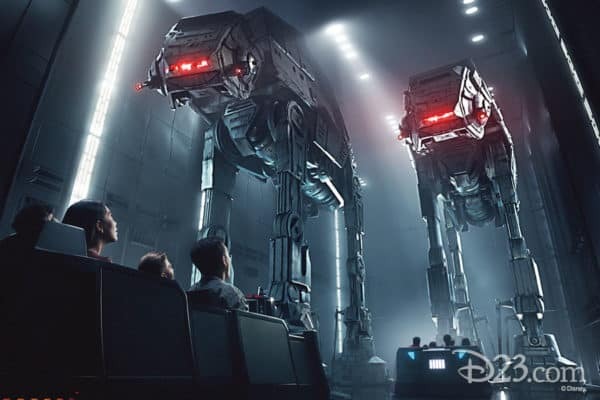 After that, the next part of the attraction has you boarding vehicles that utilize a trackless system that takes you through a hanger containing a couple iconic (and scary) AT-ATs before eventually bringing you to Kylo Ren. Expect "jaw-dropping moments" and a complete "cinematic immersive experience." Unique musical entertainment (provided by RX-24, the former StarSpeeder 3000 droid pilot from Star Tours) and amazing concoctions "created with exotic ingredients using “otherworldly” methods" await visitors to this notorious local watering hole. "Run by an intriguing alien proprietor, Oga Garra, the cantina adheres to a strict code of conduct that tries to keep its unruly patrons in check. But with a history of being a smugglers’ safe haven and a popular stopping point for those seeking to avoid the authorities, you can bet that the cantina has a story or two to tell." 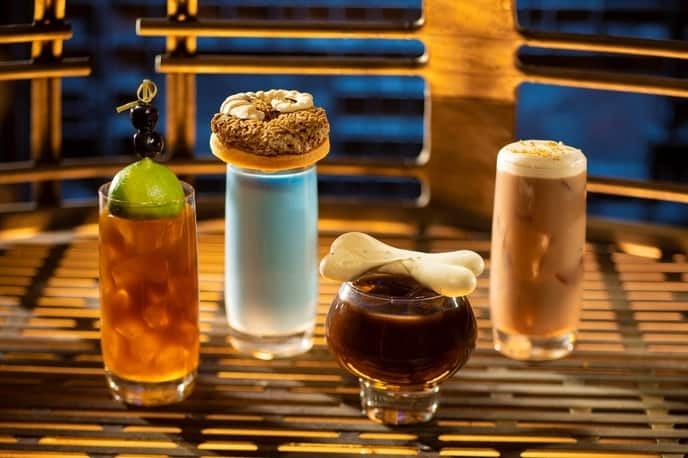 Several Star Wars-themed alcoholic beverages will also be available including: Bespin Fizz, Bloody Rancor, Dagobah Slug Slinger, Fuzzy Tauntaun, Jedi Mind Trick, Jet Juice, The Outer Rim, Spriran Caf, T-16 Skyhopper, and Yub Nub. 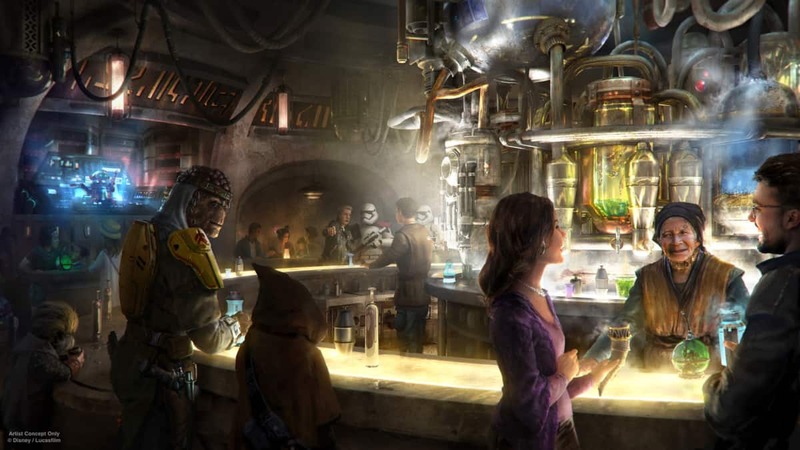 For guests under the age of 21 (or those not interested in the alcoholic ones) there is a selection of non-alcoholic beverages to choose from including: Black Spire Brew, Blue Bantha, Carbon Freeze, Cliff Dweller, Hyperdrive Punch It!, Jabba Juice, Moogan Tea, and Tarine Tea. Oga's Cantina is set to open with the rest of Star Wars: Galaxy's Edge in 2019. 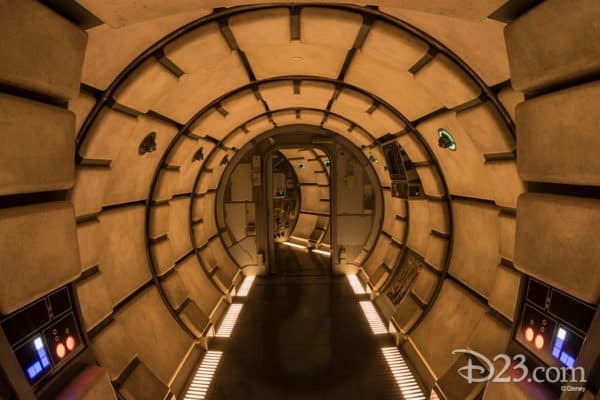 This multi-purpose transport shuttle dock will provide guests with food and drink options, all, of course, with a Star Wars story behind them. At Docking Bay 7, "Chef Strono "Cookie" Tuggs has converted his modified Sienar-Chall Utilipede-Transport into a popular mobile kitchen and restaurant." While Disney hasn't said, the wide selection of items here makes this sound like a standard "quick service" type restaurant albeit with a heavily-themed menu. Yobshrimp Noodle Salad, a marinated noodle salad with chilled shrimp. Serving primarily sandwiches and a few drinks, the menu here isn't as long as the one at Docking Bay 7. 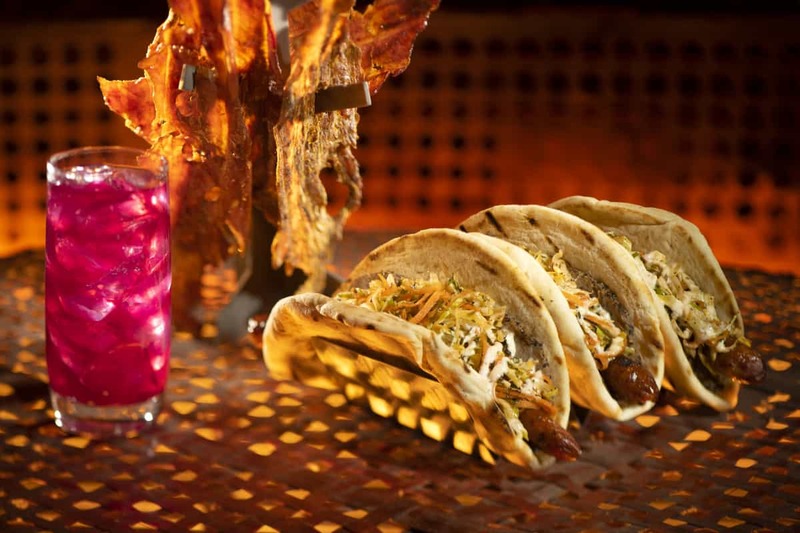 Choices here include the Turkey Jerkey and the Ronto Wrap which is a wrap filled with grilled sausage and roasted pork. What would anything Star Wars-themed be without blue milk?! 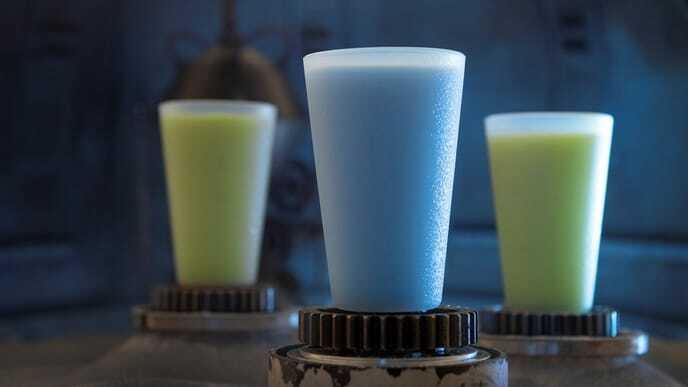 The Milk Stand will offer 2 local favorites: Blue Milk (a la "A New Hope") and Green Milk (like the stuff Luke drinks in "The Last Jedi"). Of course, what would any land in the parks be without popcorn and you can find a colorful option for that here. 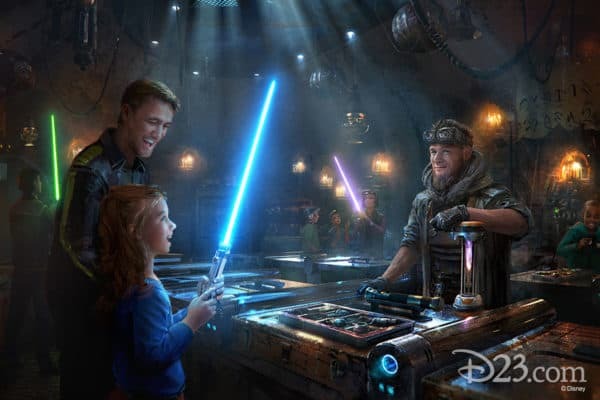 Star Wars: Galaxy's Edge will have several unique shops with a wide array of items available for guests. But - Disney is proud to say that one thing you won't find here are items you could purchase elsewhere. 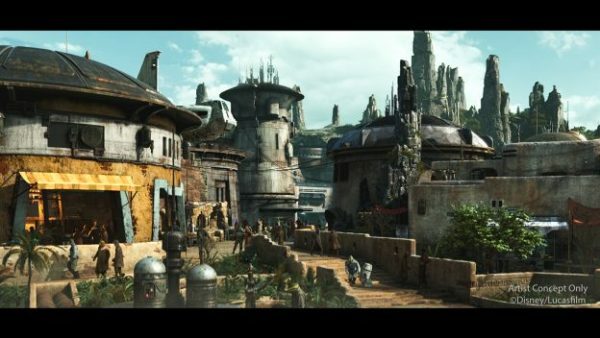 Disney says "Everything was created specifically for Galaxy’s Edge." This will be the go-to spot for guests wanting to create their own droid to take home (both R-series and BB-series options will be available). These aren't just toys to look at, though. There will be a variety of computer chips and accessories that will bring the droids to life making them a truly unique souvenir. 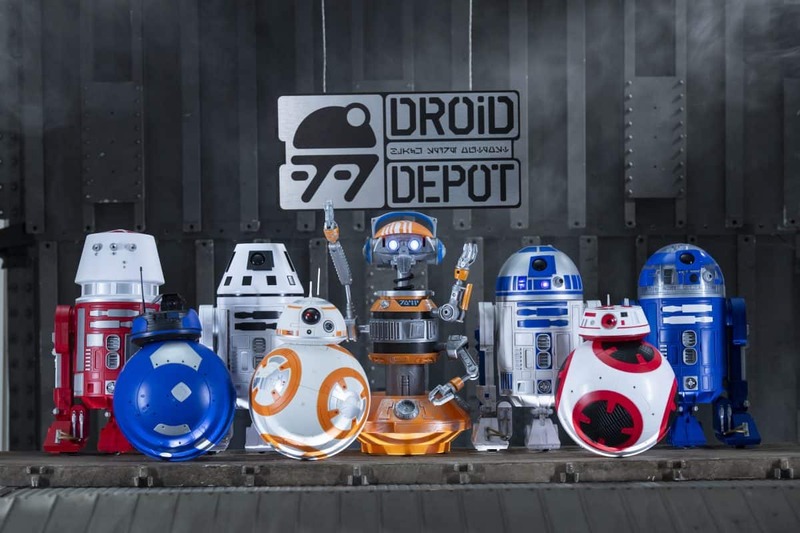 If you don't feel like making your own, pre-built droids will also be available. Ever wanted your very own lightsaber? Well, if so, you are in luck because at Savi's Workshop you'll be able to build one from scratch. And, no need to worry if you're feeling the Dark Side pulling you - you'll be able to embrace it when you choose your kyber crystal (the heart of the lightsaber). You'll have 4 options to choose from:"Peace Justice (modeled after Jedi from the Republic era); Power Control (a nod to the Sith); Elemental Nature (harnessing air, earth, fire, and water); and Defense (shrouded in mystery)." This is the go-to place for unique souvenirs and items representing different eras of the Star Wars galaxy. This spot provides tourists with the "chance to pledge their loyalty to the First Order by purchasing caps, gear, model ships, pins, and more." Here you can find hats, pins, and other accessories to show your support of the cause. In addition to the shops there are also several "market stalls" where guests can purchase items to bring back to Earth. 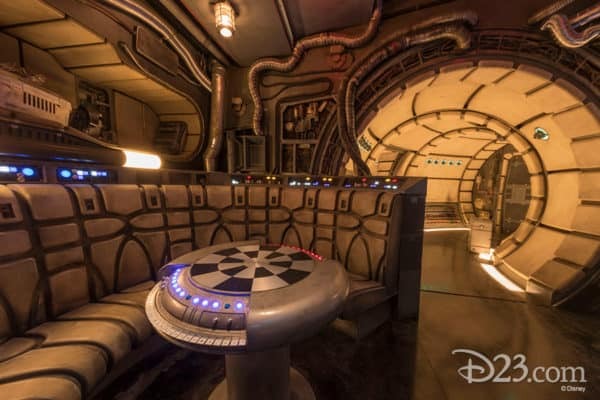 Since the initial announcement of Galaxy's Edge Disney has been consistent in talking about how guests would use technology to interact with their environment. Part of that will involve the use of the Play Disney Parks app to take guests on "interactive adventures and experiences" which will help further immerse them into the land. While there aren't specific details as of yet, we do know that the app will do things like provide translation services for the galactic language found in Galaxy's Edge, allow them to interact with items located throughout the space (which sounds a lot like the technology used in Agent P's Adventure in Epcot or Sorcerers of the Magic Kingdom), and provide missions for guests to complete. 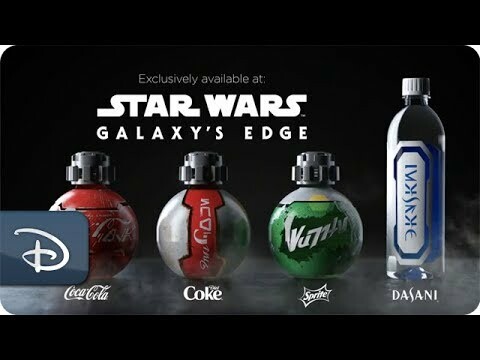 At the "Bringing Star Wars: Galaxy's Edge to life in Disney Parks" panel at Star Wars Celebration in Chicago, Disney released some new information about what to expect at the opening of Galaxy's Edge including that Star Wars themed Coca Cola products will be available for purchase in the land. Disney also released more details about the Play Disney Parks app and how it will interact in Galaxy's Edge including introducing a new game called "Outpost Control"! 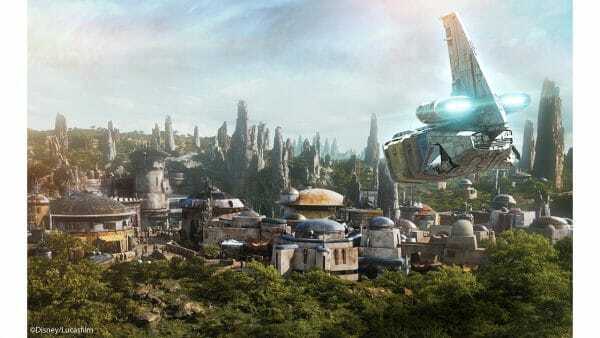 Disney has announced that Galaxy's Edge will be opening in phases with the first phase opening on August 29, 2019. At this point, the restaurants and shopping locations will be operational as well as one of the two new attractions - Millennium Falcon: Smugglers Run. The other new attraction (Star Wars: Rise of the Resistance) will be opening as part of phase 2 sometime "later" in 2019. Disney also announced that for now, neither new attraction will have FastPass+ available. We expect this to change in the future, but for now you will not be able to book FastPasses for these attractions. Galaxy's Edge and it's attractions will be open for Extra Magic Hours. We also learned the height requirements for each of the two new attractions. Millennium Falcon: Smugglers Run will have a height requirement of 38", while Star Wars: Rise of the Resistance will be 40". Disney has been busy this week with lots of promotion for Galaxy's Edge. On the D23 website Disney let loose a ton of new details on everything from restaurants to shops to costumes. There's lots to get caught up on so be sure you read more about it on the D23 website. 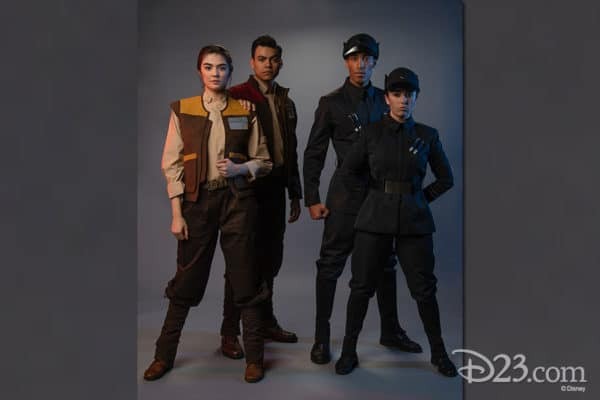 Disney is known for its storytelling - both on the screen and in the parks - and as the calendar creeps ever closer to the opening dates for Star Wars: Galaxy's Edge more and more details are being revealed that lead us to believe the storytelling guests can expect to find when they visit Batuu will be far and beyond what they've seen before inside a Disney park. As found in this article from Entertainment Weekly, one fun thing guests can expect to find will be a queue which will (hopefully) make the long waits a little less painful by incorporating incredible scenery as well as interactive elements that you'll be able to access through the Play Disney Parks app. And, the fun doesn't stop there. 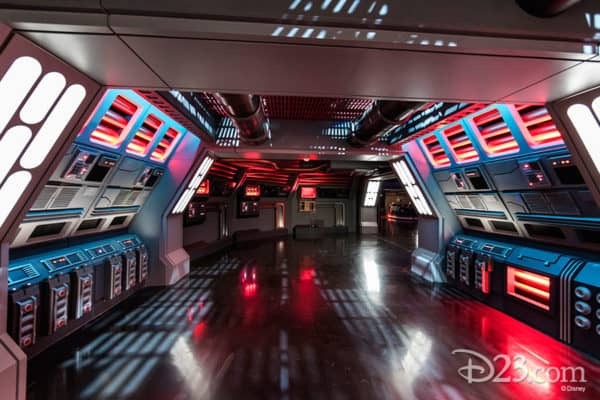 While waiting to board the "hunk of junk", guests will have the opportunity to explore the famous "chess room", something even casual Star Wars fans will find intriguing. Read more about it in Entertainment Weekly. Disney let the folks over at Entertainment Weekly get an in-depth look at Rise of the Resistance, too. Again - expect complete immersion and familiar places and faces (like Poe, Rey, Finn, and even Kylo Ren). And, while not the rumored 28 minutes long, from what we know so far, it sounds like this attraction will last far longer than just a few minutes. 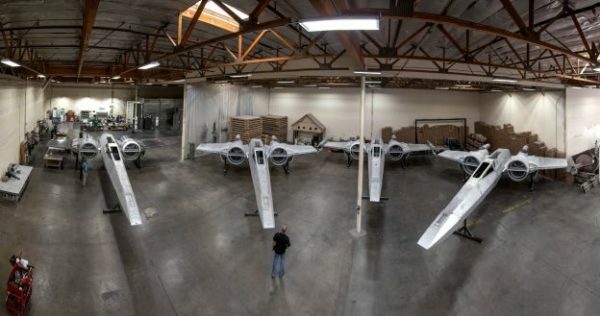 Disney Parks Blog posted a behind-the-scenes look at Star Wars: Galaxy Edge giving a sneak peek at the land and the two new attractions coming to it: Millennium Falcon: Smugglers Run and Star Wars: Rise of the Resistance. At D23's "Destination D" event, Disney Parks, Experiences and Consumer Products Chairman Bob Chapek premiered 2 new videos which not only revealed a few more details about the coming attractions, it also filled people in on the new names! It was also announced that THE John Williams himself would be composing brand new and exclusive themes for Star Wars: Galaxy's Edge. We can't think of a more fitting person to score this exciting new land. You can read more about these announcements on the Disney Parks Blog. 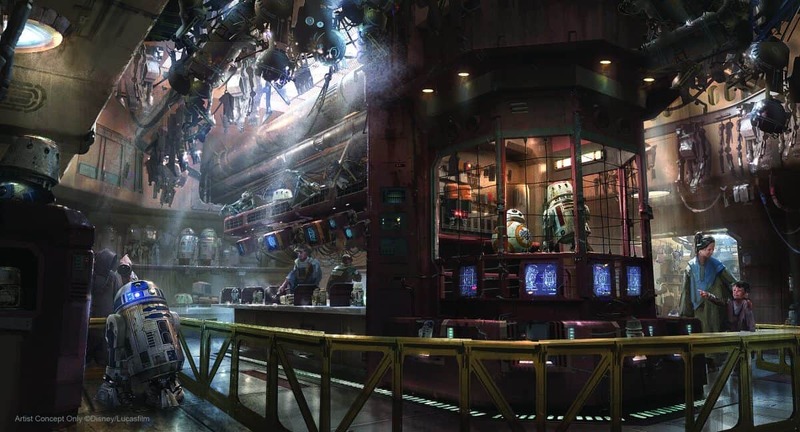 As was expected, the Black Spire Outpost in Star Wars: Galaxy's Edge is getting a cantina that will be serving "pilots, bounty hunters, smugglers, locals and galactic travelers alike." Read more about the preliminary details in the Disney Parks Blog. 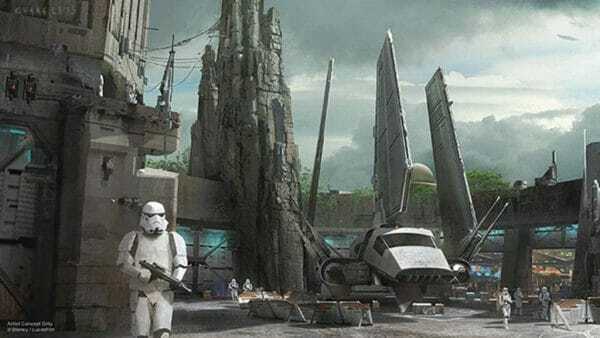 Everybody has been on edge waiting for details on the much anticipated new Star Wars-inspired resort coming to Walt Disney World. Disney has released a little bit more information and now we know its location. According to Disney, the resort will be located on the south side of Disney's Hollywood Studios, just to the east of World Drive. We're still waiting on many other details, though, like price point and opening date. At Star Wars: Galactic Nights, the name of the village area guests will visit on Batuu was revealed. Black Spire Outpost is the largest settlement on Batuu and, as Disney says, is "an infamous stop for traders, adventurers, and smugglers traveling around the Outer Rim and Wild Space." Disney has just confirmed the season for the opening of Star Wars: Galaxy's Edge at Hollywood Studios: Late Fall of 2019. This new, totally immersive resort experience just became even easier to imagine with the release of some new conceptual video. 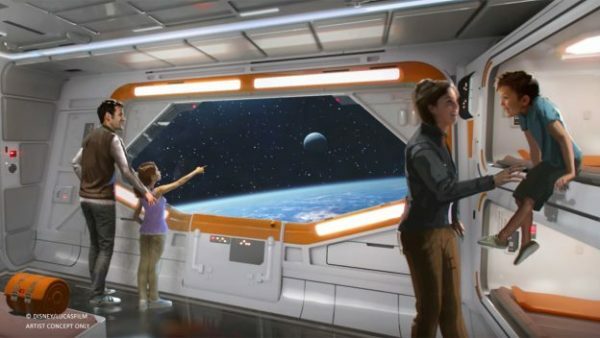 We now know that this resort will "connect seamlessly" to Star Wars: Galaxy's edge which will allow guests to fully surround themselves in the Star Wars experience. No word yet on when construction will start (or more importantly when the resort will be ready to open) but these latest images are sure to get people excited! 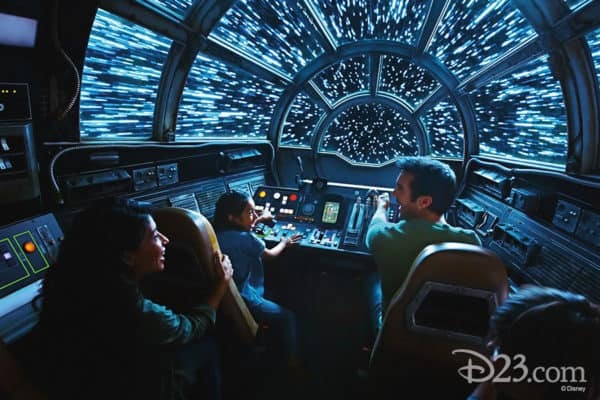 To wrap up the 12 Days of Christmas news Disney pushed out this holiday season, fans were rewarded with some new details about the upcoming Star Wars land - Star Wars: Galaxy's Edge. It sounds like Disney is doing what Disney does best with creating an in-depth, totally immersive experience. Read more about this latest update on the Disney Parks Blog. 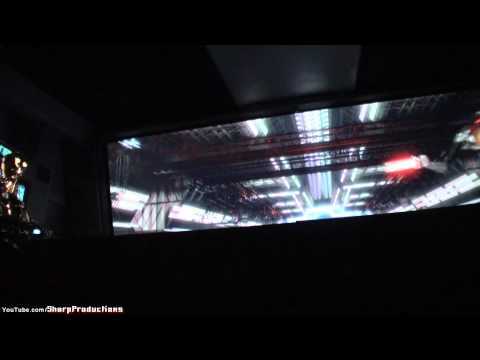 The newest destinations for Star Tours started this month and included a sneak peak at what guests might expect to see when the new Star Wars: Galaxy's Edge opens in 2019. Not only were guests treated with a peek at the new planet, we also now know its name: Batuu. 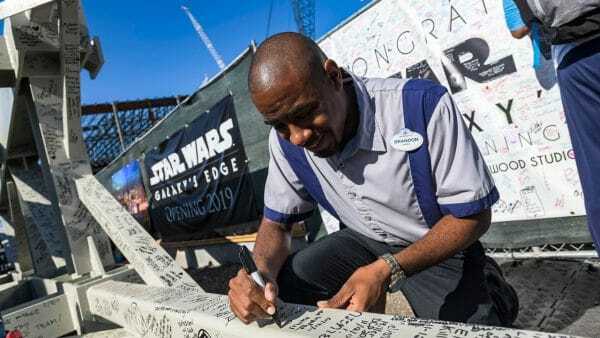 A major milestone was met as Cast Members and Imagineers involved in the construction of the new Star Wars: Galaxy's Edge lands took out their sharpies and added their names to beams that will be installed. A new sequence for Star Tours will make its debut at Hollywood Studios on November 17, 2017. This new sequence is inspired by The Last Jedi and will take place on the planet of Crait. Need to see The Last Jedi trailer again? Catch it below. Read more about the new sequence on Star Tours on The Disney Parks Blog. After unveiling the models at D23 in July of 2017, Disney is bringing a portion of that epic model to Hollywood Studios for guests to preview. The model will be available starting in mid-September and will be housed in the newly re-named Walt Disney Presents (formerly called One Man's Dream). In addition to the Star Wars: Galaxy's Edge model, guests will also have access to a never-before-seen model of Toy Story Land, as well as concept art for the new Mickey and Minnie's Runaway Railway attraction. More details can be found on the Disney Parks Blog. 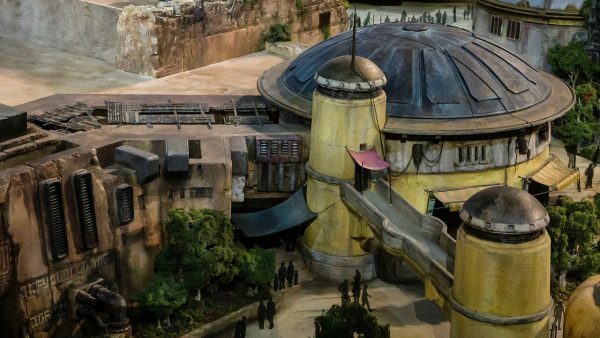 Fly through the Star Wars: Galaxy's Edge model that was just reveled at the D23 Expo. The details are beyond impressive! 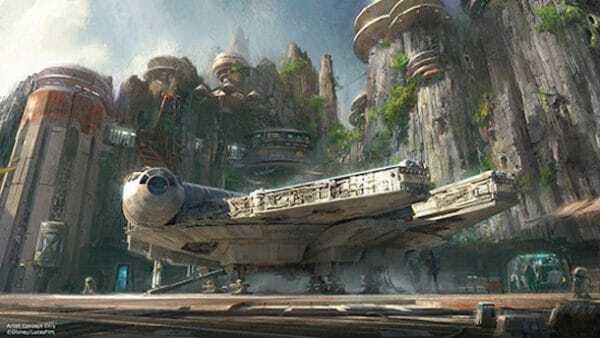 If the details on what to expect at the newly named Star Wars: Galaxy's edge weren't enough, the news that a new highly-immersive Star Wars-themed resort had the crowd gasping in excitement. Disney Parks Blog has more details and images; we can't imagine the experience will be cheap, but it definitely looks impressive! We have a name! Star Wars: Galaxy's Edge. This new land will take guests to a remote trading port on the edge of space where they'll find 2 new attractions, a totally immersive experience and even some blue milk. Check out what Disney's Park Blog has to say about it. The new Star Wars-themed land construction continues with some well known shapes beginning to take form. The video is from Disneyland, but the attraction at Disney's Hollywood Studios will be the same. 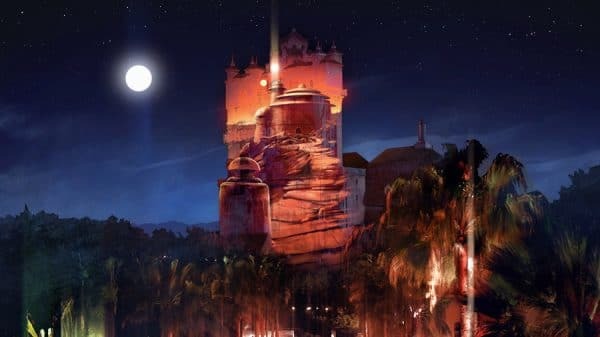 If the new Star Wars-themed land at Disney's Hollywood Studios is destined to look amazing in the daylight, then the nighttime just might be spectacular according to the latest from the Disney Parks Blog. 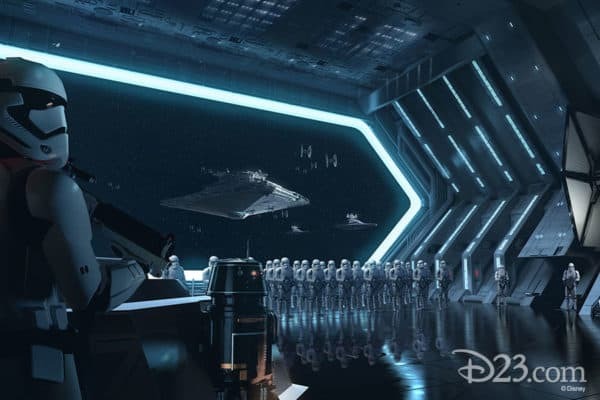 Disney used the opportunity during their "Wonderful World of Disney: Disneyland 60" special last night to drop a few more hints and details as to what to expect to see at the new Star Wars-themed lands. Some of the best news was that one of the signature attractions of this new land will have guests piloting the "fastest ship in the galaxy" (The Millennium Falcon). At D23 in Anaheim, CA, The Walt Disney Company Chairman and CEO Bob Iger made the much anticipated announcement that 2 Star Wars-themed lands will be coming to the Disney parks: one at Disneyland and the other at Disney’s Hollywood Studios at Walt Disney World. These lands are not only impressive because they are Star Wars-themed (something fans worldwide have been begging to see) but they are also going to be HUGE (14 acres each) and will be Disney's largest single-themed land expansions ever. In comparison, the most recently constructed new land at Disney World is New Fantasyland at Magic Kingdom which capped out at a total of 11 acres. The new land will also include 2 new attractions, but no confirmation yet on blue milk. You can read more about what is coming in the years ahead on the Disney Parks Blog. Star Wars: Galactic Nights is a one night only, family-friendly Star Wars-themed event hosted at Disney's Hollywood Studios. No events for 2019 have been released yet, but the 2018 event fell around the date of the release of the newest Star Wars film, Solo: A Star Wars Story. A similar event happened in 2015 and 2017 to coordinate with Episode VII - The Force Awakens and Episode VIII - The Last Jedi. Below is the information for the 2018 event. If Disney releases a 2019 date, we will update the information below at that time. Cost: $129/adult, $124/child Guests could purchase Star Wars: Galactic Nights tickets online. With the release of the much anticipated Solo: A Star Wars Story happening on May 25th, Star Wars: Galactic Nights will feature some exclusive content during the evening's festivities. 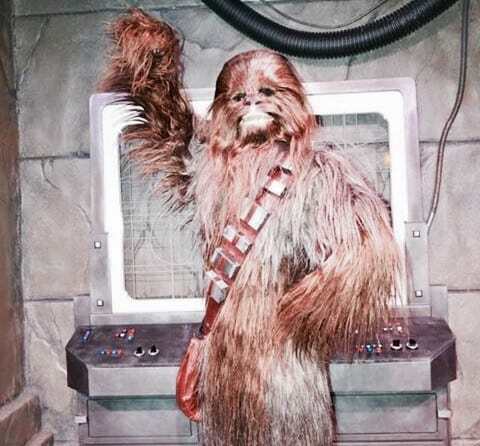 Actor Joonas Suotamo (Chewbacca) will be making a special appearance, and the event's Star Wars: A Galaxy Far, Far, Away presentation will debut some new video moments from the movie. And, don't forget the merchandise! In addition to Star Wars: A Galactic Spectacular (which is shown on the front of the Chinese Theater) guests will be treated to a new projection show done especially for this night. This new show, called Star Wars: Destinations will transform the front of the Hollywood Tower Hotel into scenes from your favorite Star Wars movies. Star Wars: Galactic Nights wouldn't be complete without this popular show. Catch it at the Chinese Theater and new for 2018 will be the debut of new enhancements to this popular show. Guests can expect to see all the regulars at Star Wars Launch Bay (BB-8, Kylo Ren, Darth Vader, and Chewbacca). In addition, guests are likely to spot Storm Troopers, Ewoks, and AWR Troopers. This one-night-only panel discussion will take you behind the scenes of the all new Star Wars: Galaxy's Edge section of Hollywood Studios. A panel of Imagineers will be joined by David Collins (veteran Star Wars voice actor) as they take you on a journey into the development of this exciting new land. There will be lots more to see and do during the night (including special photo opportunities, special food items, and a dance party) plus there are opportunities to upgrade your experience with special dining packages and wine seminars (about Skywalker Vinyards, of course!). So, what do you think? 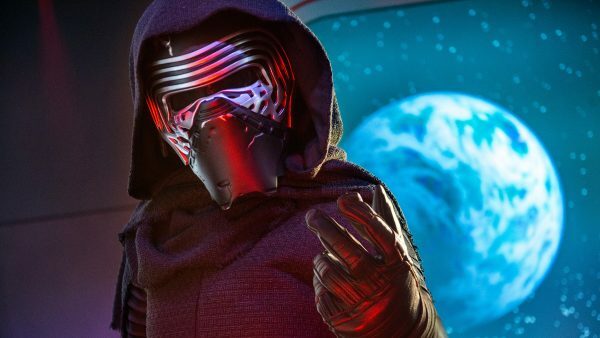 Are you looking forward to experiencing Star Wars at Disney World on your next trip? Got questions about what you can find? Let us know in the comments. Should we call and move our reservations? I’m a HUGE Star Wars nerd. 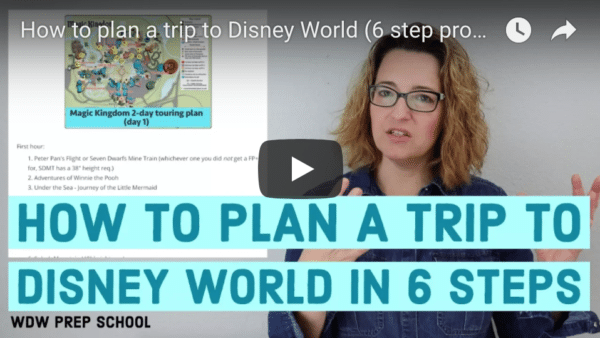 But we planned our very first Disney trip with grandparents the 5-12 of September to take advantage of free dining and AVOID CROWDS. I’m seriously considering moving our trip two weeks, going the end of August. What kind of work is involved with that? (We’ve already booked at pop, made AD reservations etc.) would you suggest we move everything around? Is the star wars upgrade to vacation package worth the money?? The reservation lady said it comes with a costume, door banner, jedi training early sign up and special edition medallion after special mission is completed. I feel like it will be worth it but wanted other opinions. It sounds like the Cast Member combined 2 things when talking to you. 1.) The Star Wars Rebel Adventure from Disney Floral that delivers Star Wars items to your room, and 2.) The Star Wars Guided Tour at Hollywood Studios. Not sure if they’re worth it, but I’ve had only great experiences with Disney World tours and Disney Floral. Oh that looks amazing…but unfortunately our last day at the parks is Fri 12/15, we will be driving home on the 16th….